A mountain lion was seen several times near the Vandenberg Village Golf Course, most recently it was seen eating the carcass of a deer. The Santa Barbara County Game Warden received a report Thursday morning of the lion feeding near the 11th tee at the Mission Club, located at 4300 Club House Rd in Lompoc, reports KSBY. The club is located near a residential area and Vandenberg Village. Other reports came in from people seeing a mountain lion on Wednesday and Thursday near the same area. Deer are commonly seen grazing in the area. The Mission Club General Manager Russ Sandy reportedly told KSBY this is the first time something like this has happened on the course, but a maintenance crew spotted the mountain lion around 6:00 a.m. Thursday which then hissed at them. The carcass was moved and the Game Warden assured the staff the area was safe for people to play golf. It's important to know when coming within close range of a mountain lion to stay calm and never turn around and/or run. The National Park Service recommends holding your ground or backing away slowly while facing the lion and standing upright. Do not approach the animal and do not crouch or bend over. If the mountain lion moves in your direction, do all you can to appear intimidating by raising your arms and speaking in a firm loud voice. If the lion moves in your direction, start throwing things directly at it. And if it does attack, fight back using whatever you can. 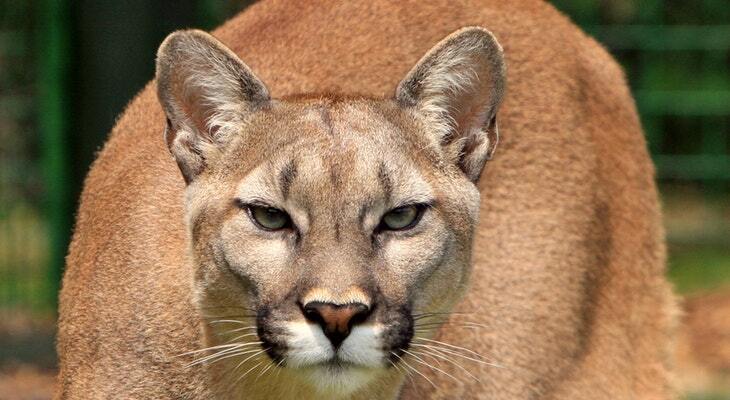 More safety tips about encountering mountain lions can be found here. DEER - It's what's for dinner! I love the part that golfers are assured it is safe but not to crouch or bend over. Then if you are attacked to throw things and to fight back using whatever you can. Like people need instructions to fight back while being eaten alive. Nature at work. This way we don't have humans going on the rampage of "culling" deer because of deer over-population. Keep up the good work, Mt. lions.